A good night’s sleep really refreshed me. At 6am I got up with the rain slanting down, but not too much wind. At 7am I had breakfast with a couple from Amsterdam, and another couple from Wellington, NZ, who were leaving on the 8am ferry. Right on time, my tour guide, Furhana, turned up and delivered me to a water taxi dock for the trip across Halfmoon Bay to Ulva Island. There we met the others on the tour—Dale, a sixtyish guy from western Montana who had worked as a contractor at the Antarctic McMurdo Sound Base in the Ross Sea, and a young couple who were going to school in Christchurch, Christina from Germany, and Alistair, from London. The water taxi zipped us through the rain to Ulva Island, which is a mile or two from Stewart Island proper.  It is an unusual island in that it had never been logged, and retained most of its original forest. Nor had it any history of invasion by the pestiferous Australian Possum. Rats and Deer had been eradicated from the island in the 1960s, and some birds had been introduced. But the vegetation was pretty much native, and most of the birds were naturally occurring. We saw many of the same rare endemic birds that I’d seen on Tiritiri Matangi out of Auckland, but there were some differences. The Saddlebacks were pretty much the same, but the New Zealand Robins here were larger than those on Tiritiri, and they had white breasts, rather than being all gray birds. 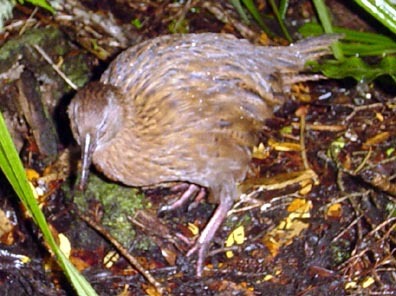 There were lots of Weka’s here, and they were a shade lighter than the one I’d seen at Pancake Rocks a few days ago. All of the birds, Bell Birds, Tui’s, Robins, Weka’s, Saddleback’s, etc were very tame and fairly easy to approach closely. Maybe this was because of the rainy, dark conditions. Some new birds to me included the Kaka, a large forest parrot, closely related to the Kea, Brown Creepers (not related to our Brown Creeper at home) and on the coast, large Spotted Shags. The birds here that we did not see included Yellow Crowned Parakeets (we saw the Red Crowned sort), Riflemen (New Zealand’s smallest bird), and the Yellowhead. 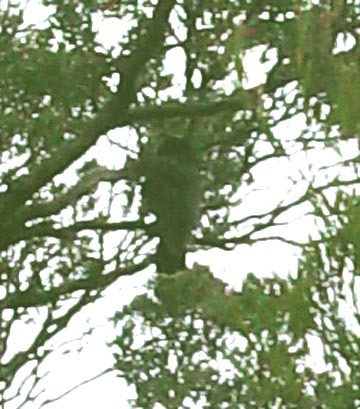 This is a Kaka, above. 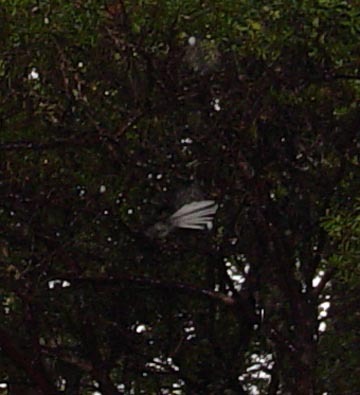 With its green plumage, it blends right in with the canopy. 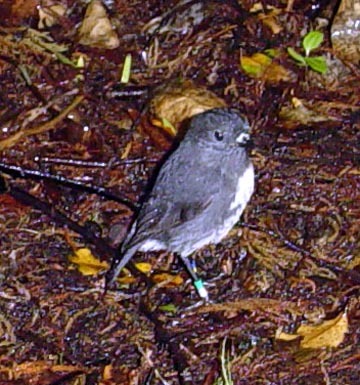 The New Zealand Robin, below, is not closely related to our robin, but makes some very similar sounds. Notice the bands on the robin. Most of the birds fledged on the island are banded by students and conservation personnel to gather life history information. 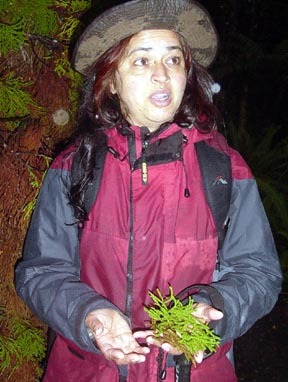 In addition to the birds, Furhana, was very knowledgeable about the trees, ferns, and mosses on the Island. I found some of the trees that change form as they grow very interesting. 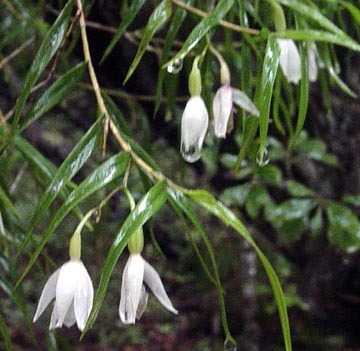 These include things like Lancewood and Rimu trees that have very different leaf forms when young and when mature. 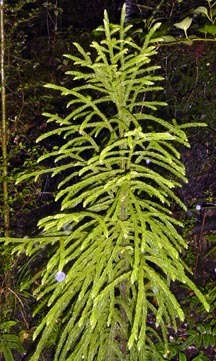 New Zealand has more species of podocarp trees (like the Rimu) than anywhere else in the world. These are similar in some ways to our gymnosperms, but develop single seeds enclosed in a fleshy “fruit.” They really represent relict species. And the ferns and fern trees are wonderful. You can stand in one place and look around and see a score of fern species. New Zealand is home to almost 200 species of ferns, which is a huge percentage of the world’s fern flora when you consider the very small land area of New Zealand. 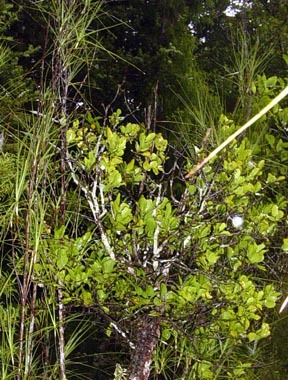 Other plants among the profusion on Ulva Island included the small Easter Orchid on the left, and a broad leafed mistletoe growing out of another tree. So, it was a great trip. After water taxiing back to Stewart Island proper, I had a nice lunch of batter fried blue cod at a cozy hilltop restaurant with a warming fireplace (the temperature was in the 50s F, and walked around town a bit to get the lay of the land. At dinner Neil and Elizabeth from England and another couple from The Netherlands. wE had a great time joshing back and forth. Elizabeth had a lot of fun with the idea of my writing a book about Antarctica, without having been there. It was a good time. Tomorrow I don’t have a particular plan in mind, but will hike some of the trails, and maybe relax and rest up a bit for the final six days of my trips to Dunedin and Christchurch.